The rich & varied history of Yellowstone National Park has been expressed in all media since 1872 when it was established as our nation's (and the world's) first National Park. Since that time artists and craftsmen have creatively captured its charm and beauty in such diverse media as colorful prints, hand-tinted photographs, chromolithographs, posters, WPA illustrations, engravings, various ephemera, and collector plates, beautifully illustrated playing cards, and souvenirs of all sorts. Now, over 125 years have passed, and collectors world-wide covet these early expressions from the ubiquitous postcard to the simple matchbook. Renowned artists & photographers such as Thomas Moran, William Henry Jackson, F.J. Haynes and his son, Jack Ellis Haynes - now all deceased - have left their indelible marks on these treasures. To appreciate their artistry, take a close look at the grandeur of Yellowstone through their eyes and capture for the moment a piece of Yellowstone History. 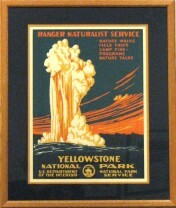 The Yellowstone Gallery is able to offer some of these rare specimens along with reproductions for a limited time.